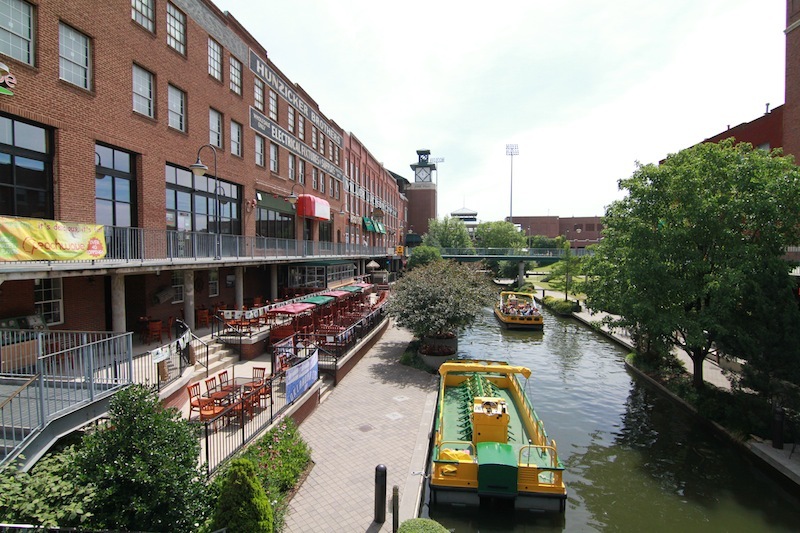 Pretty waterway on our short stroll from CocoFlow to Bricktown Candy Co.
A couple weeks ago I posted about a trip Jeremy and I took to Oklahoma City to visit a few bakeries and cupcake shops, all in the name of research, of course! 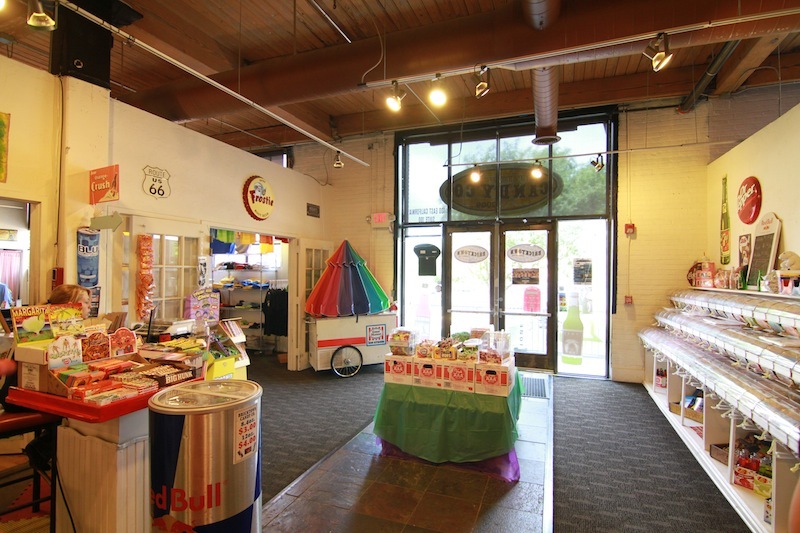 We started out our day bright and early with Sara Sara Cupcakes and from there hit up CocoFlow and Bricktown Candy Co. I won’t go into many details because either of these places because I honestly wasn’t blown away by them. But here’s a quick rundown with lots of pictures! 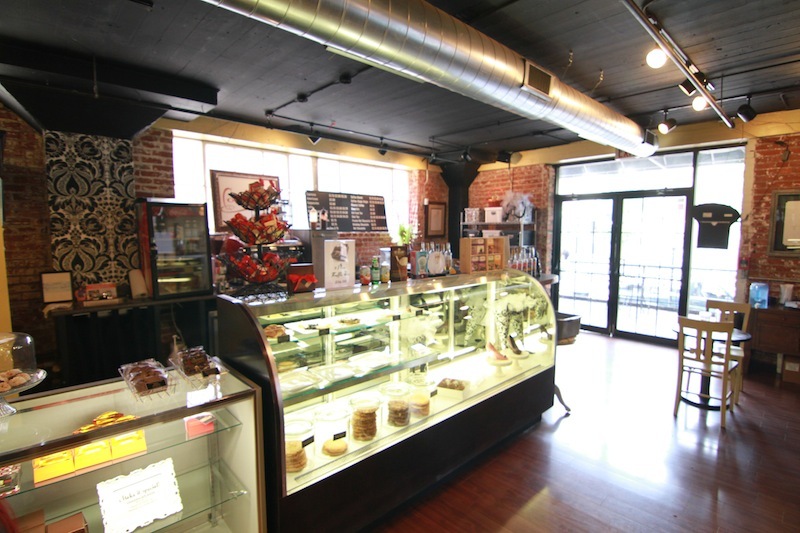 One of the bakery cases at CocoFlow and a shot of the interior. I choose CocoFlow because I thought it would be neat to go to a place that wasn’t cupcakes and instead focused on chocolate truffles. 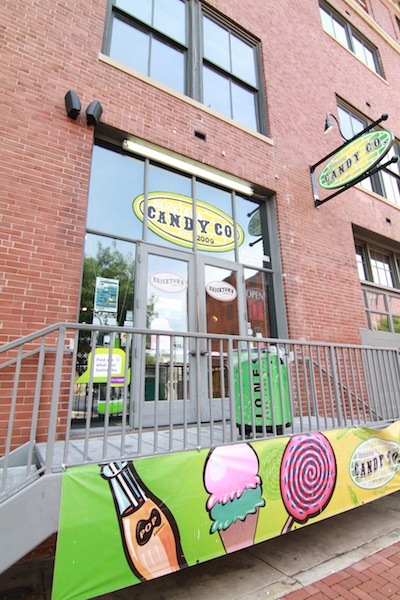 I was actually really excited to visit this little shop right in the heart of Bricktown. It was a very unassuming, cafe type space. When we got there, there was actually a chocolate making class in full-swing which I thought was SO cool and wanted so badly to join but we would have had to have previously signed up so it was a no-go. They had a pretty good variety of chocolate truffles to choose from, a few jars of HUGE cookies and some other miscellaneous baked goods. 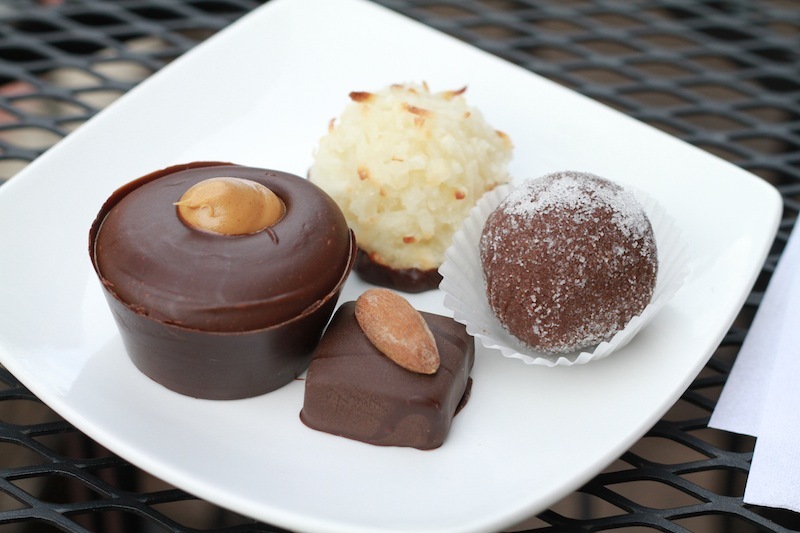 I choose a Chili Truffle, Marzipan Truffle, Peanut Butter Cup and Coconut Macaroon. Jeremy got a lemon bar. Peanut Butter Cup at CocoFlow. My first indication of the quality of this place was when employee waiting on us unwrapped the previously made (who knows when?) lemon bar right in front of us and plopped it on the plate and then proceeded to ask if we wanted powdered sugar on it or not. Umm, sure. She then proceeded to ring up our treats (unsuccessfully) and after five or six attempts we were finally able to pay and headed outside to sit on the deck, in the lovely late morning weather. I’m going to be honest here…the Chili Truffle was a huge bomb. We wondered if we got the right thing because there was absolutely ZERO chili/heat to this thing and it was coated in granulated sugar which I just thought was weird. 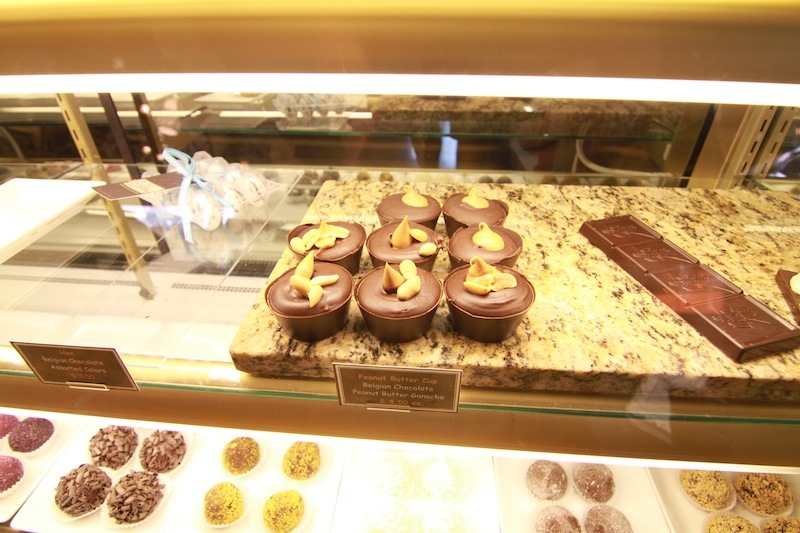 The Peanut Butter Cup was actually a massive chocolate ganache truffle, dipped in chocolate and then topped with a dollop of peanut butter. The Marzipan Truffle was again, a thick layer of ganache, a very thin, barely there layer of marzipan and it was dipped in chocolate. 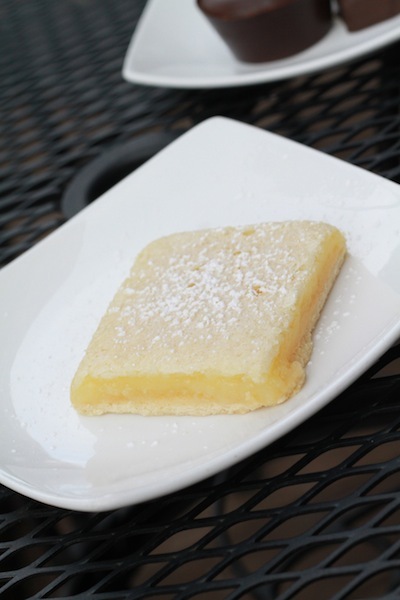 The lemon bar was ok. Lemon goo and a shortbread crust and almost too sweet. My favorite (and the only thing I liked..actually I LOVED this thing) was the Coconut Macaroon. It was decadent and chewy, had loads of almond flavor and was dipped in a dark chocolate. It was divine. Needless to say we won’t be back to that place…unless of course, to get a coconut macaroon. Truffles and Coconut Macaroon from CocoFlow. 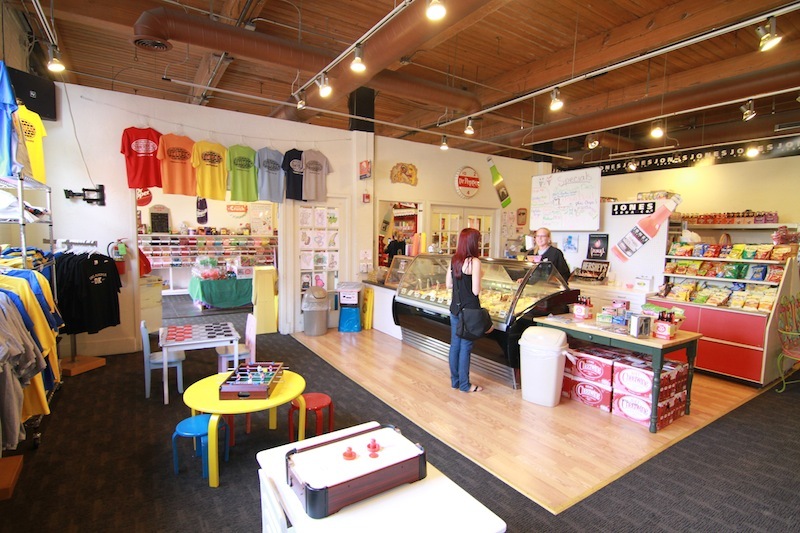 Bricktown Candy Co. was also nothing to write home about. I was kind of shocked by the aesthetics of this place. They have a prime location in the heart of a historic district but the inside is very rundown, warehouse like. 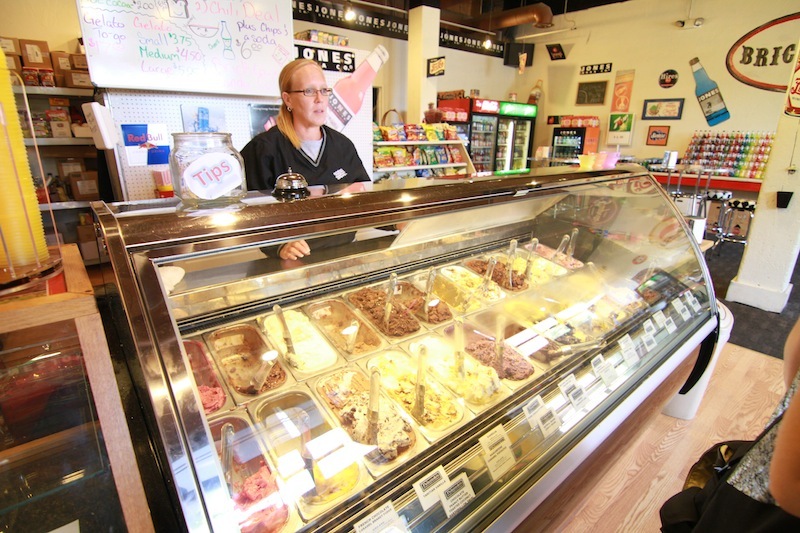 It’s pretty big and divided into one side which is primarily bulk candy and the other side is gelato and almost every bottled drink and soda known to mankind. The candy was ok but pretty much the same thing I can get at our local Mr. Bulky’s. Not the best or freshest but definitely not stale and gross. Just good, standard candy. I did try the gelato and it was actually really good…if it hadn’t been 11 in the morning I probably would have gotten some but it was just a little early for ice cream (But ya know not too early for chocolate, cupcakes and candy. Ugh.). 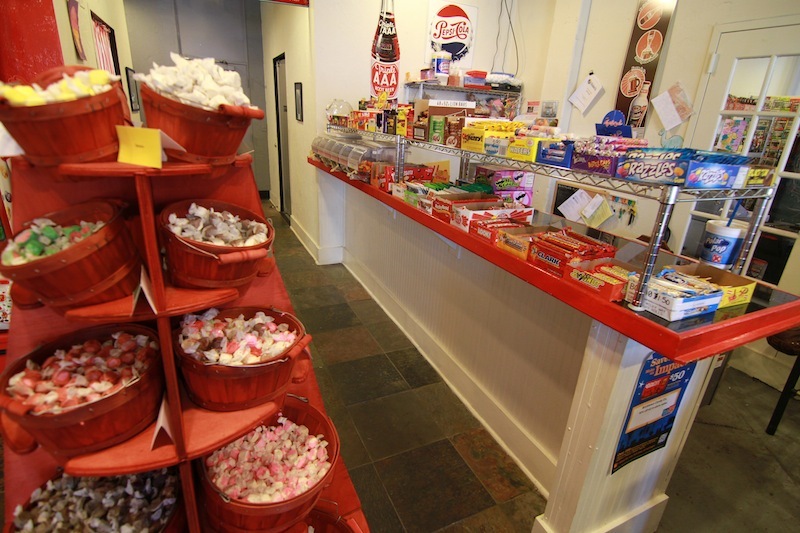 A shot of the bulk candy side of Bricktown Candy Co.
Taffy and other miscellaneous candy at Bricktown Candy Co.
My biggest issue with this place? The teenager girl that was working the cash register, smacking her gum and talking on a phone the WHOLE time we were there, including while we were checking out. Gee, sorry are we interrupting your highly important conversation?? Don’t mind us, just customers wanting to GIVE YOU MONEY. I mean, really?! It was so rude. To make matters worse, one of the managers was there and knew she was on the phone and apparently didn’t think anything of it. We totally felt like we were an inconvenience to this girl’s phone call. Yeah, not going back. Gelato! It was good. The peppermint was my favorite. 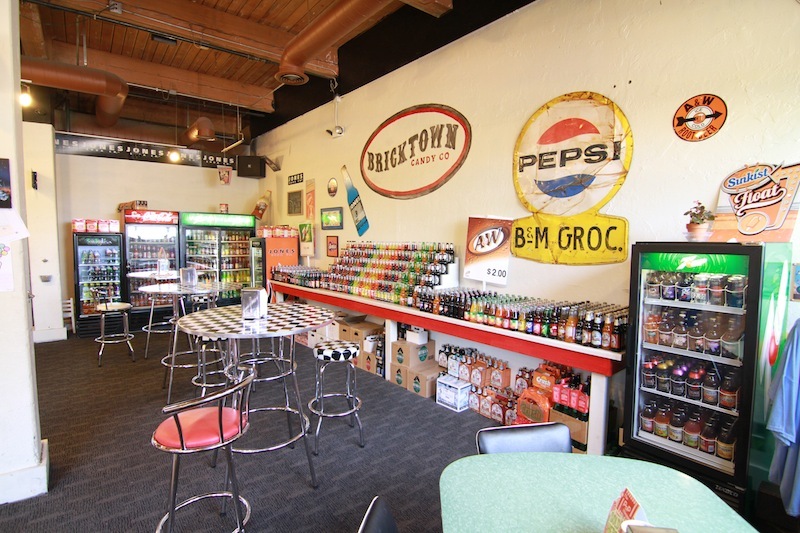 Walls of Soda at Bricktown Candy Co. 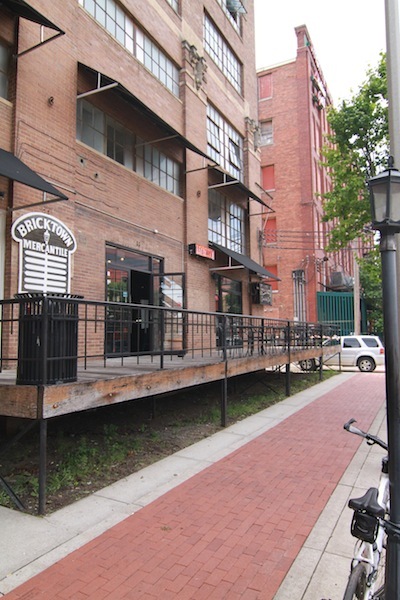 This was the side of Bricktown Candy Co. that had the gelato, soda and other paraphernalia. Ok, so not such great choices on my part but it was still fun to try some new places. And the day definitely gets better! Next review–Pinkitzel! Hey friends! Hope everyone has had a great Easter Sunday…ours was filled with a wonderful church service, lunch with family and…well, that’s about it! Yay for lazy Sundays! 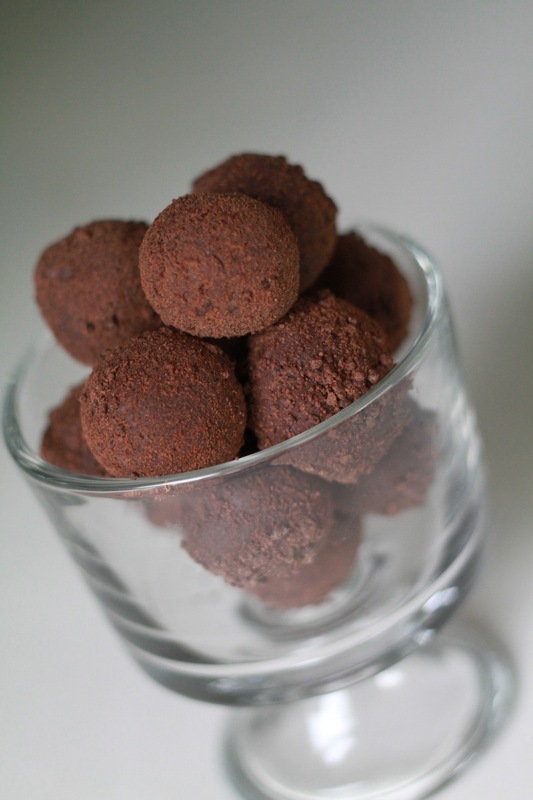 I wanted to share a recipe for homemade chocolate truffles with you guys tonight. You know, the kind you pay major bucks for at Godiva or another fancy chocolate shop?? Yeah, that’s the kind I’m talking about! 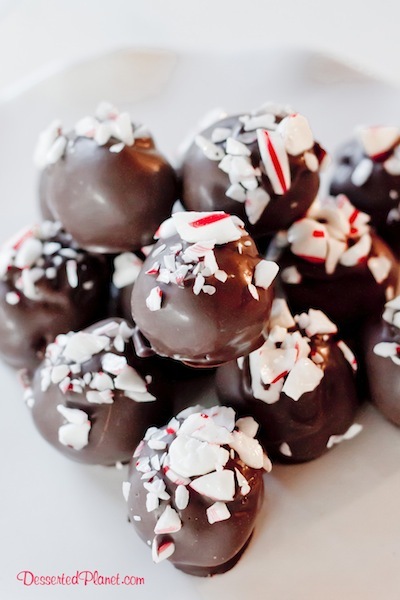 It’s soooo easy to make gourmet truffles on your own at home. They are probably one of the first candies I ever made. I moved on to other things like homemade marshmallows, chocolate covered cherries, turtles, caramels and toffee, but honestly, there is just something so decadent and indulgent about chocolate truffles. Especially when they are made with quality ingredients. 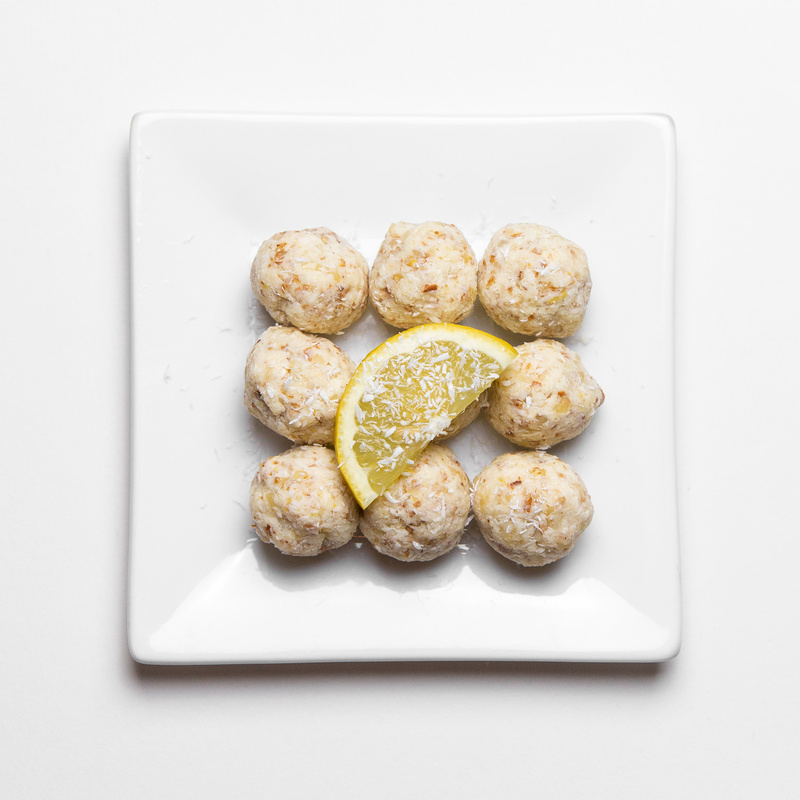 When I first started making truffles, I really enjoyed experimenting with them. I remember how many bottles of liquor I had in my house…and NOT for drinking! Hah! No, no it was all used for candy making! It is super simple to add a little citrus zest, extract or liquor to your chocolate and get a variety of gourmet chocolates. Some of my favorites were Starbucks coffee liquors and berry liquors. Can you say YUM?? So use this recipe as a starting point and see what flavors you can add for your own homemade box of chocolates! 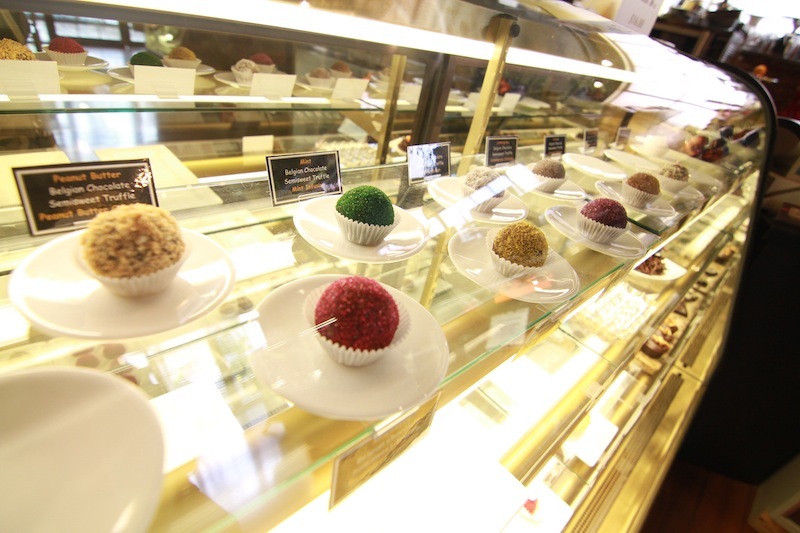 I think once you see how easy it is, you’ll never visit a pricey chocolate shop again! Place the chocolate in a medium bowl. In a medium saucepan, heat the heavy whipping cream over medium heat just until it boils and pour it immediately over the chocolate. Let it set for 1 minutes and then stir with a spoon or spatula or whisk until completely smooth. If adding flavor, do so now. Let cool completely and then place in fridge for a couple of hours until the mixture is firm but not stiff or refrigerate overnight (if you refrigerate overnight, let it set out for about 30 minutes to it has softened just a bit and you can scoop it more easily). Using a melon baller, scoop 1" size truffles onto a large baking sheet lined with foil. If the mixture is not too soft, roll into balls with your hands. If it is too soft, place in the freezer for a few minutes to allow to firm up a bit. Once you've shaped the truffles into balls, you can roll them in chopped nuts, finely chopped chocolate, etc or dip in melted chocolate. Homemade candy is one of my all-time favorite things to make. I started making my own candy at home about 5 or 6 years ago and have loved it ever since. In the beginning, I even took a couple of classes through a local college in town, which was a lot of fun and I definitely managed to pick up some good tips that I still use to this day. Part of what I love about making candy (and even baking) is that there really is a science behind it…ingredients have to be weighed and measured properly, mixing of ingredients has to occur in a certain pattern and temperatures have to be just right to get the kind of candy you want, whether soft, chewy, hard, etc. It all sounds kind of intimidating at first but all it takes is a little reading and testing out a few recipes and before you know it you’ll be making your own homemade caramel, marshmallows, peanut brittle or whatever candy you crave and impressing everyone you know! 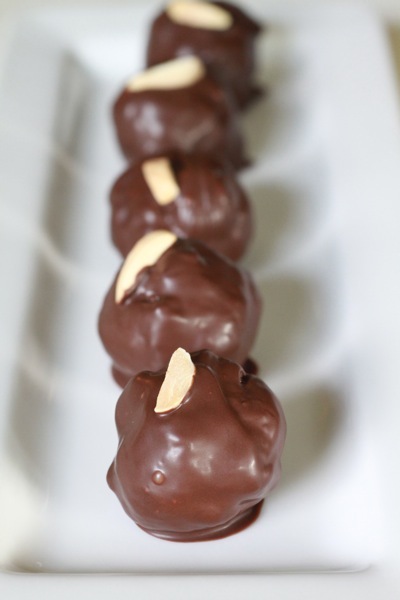 So today I’m sharing a very simple recipe for Almond Joy Truffles. This was one of the first things I made in my candy making class years ago and I still love it. These little coconut bites taste just like the candy bar you can get in your local grocery store…only without all the extra junk they tend to put in. I put toasted almond slivers on top of mine but if you’re not a nut fan, sprinkle them with toasted coconut or drizzle with white chocolate. Very pretty and tasty. Enjoy! Place coconut in a medium bowl. Bring the corn syrup to a boil over high heat. Pour the corn syrup over the coconut and gently mix to coat. Let this sit for at least one hour. Melt chocolate in a bowl in the microwave at 20 second intervals, stirring between each time until completely smooth and melted. 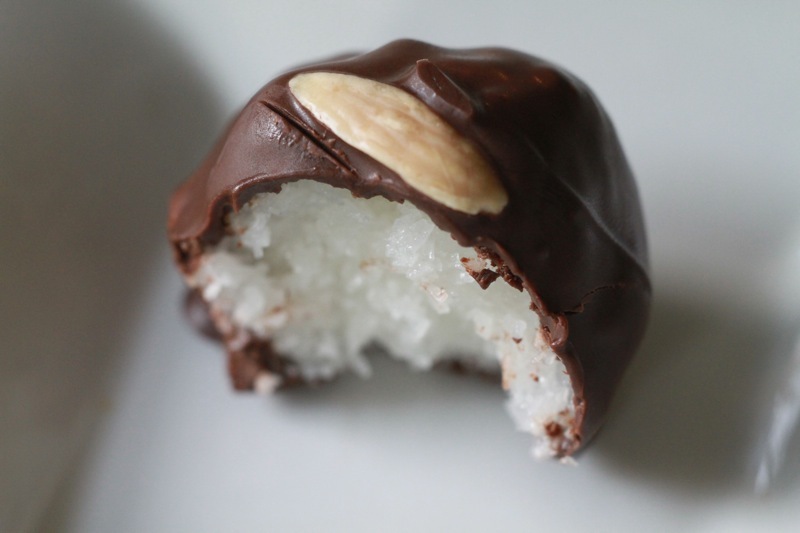 Roll the coconut into small balls and dip in the chocolate. Top immediately with one almond sliver (or whatever you are using) and let dry completely on foil.